This is a breakfast you’re able to make the night before and keep refrigerated overnight. It’s quick, easy and vegan friendly! You simply need some almond milk, oats, an apple and some raisins. You’ll also need a glass jar with a lid. 1. Put cup of oats in your jar. 2. Dice up your apple and place in the jar, followed by a small handful of raisins. 3. Add a small amount of cinnamon if you want a bit more flavour. 4. Put the lid on the jar and shake ingredients together. 5. Add almond milk to the mixture so it comes to just above the mixture. Put the lid on the jar and shake. 6. Place in fridge overnight to thicken. This is a real quick recipe that literally takes 10 minutes. You will need 3 eggs and whichever ingredients you want to add to the mixture. I like to put ham, peppers, leek, mushrooms and cheese in my omelettes. 1. Crack eggs into a bowl and whisk until smooth. 2. Dice ingredients and add to the egg. 3. Heat pan with some fry light on low temperature and add omelette mixture and let simmer until cooked. Keep checking it isn’t sticking! 4. Flip once bottom is cooked to let the top cook. 5. Once cooked through, serve on plate. This is a super easy and quick vegan recipe! All you need is 2 medium sweet potatoes, a casserole vegetable pack, wholegrain microwave rice, and a curry sauce jar. You could make your own, but I’m all for quickness and ease when it comes to cooking. I like rice with my curry, but this is totally optional if you don’t feel like it’s necessary. 1. Peel the potatoes and dice into 3cm cubes. 2. Boil these in a pan of boiling water until completely soft and you’re able to stab with a knife cleanly. 3. Heat up the curry sauce in a wok and add the sweet potato and stir together. 4. While the sauce is on a low temperature, boil the vegetables in a pan of boiling water. 5. When soft and you’re able to stab them cleanly with a knife, drain and add to the curry. 6. Leave to simmer for 5 minutes. 7. Put your wholegrain rice in the microwave. 8. 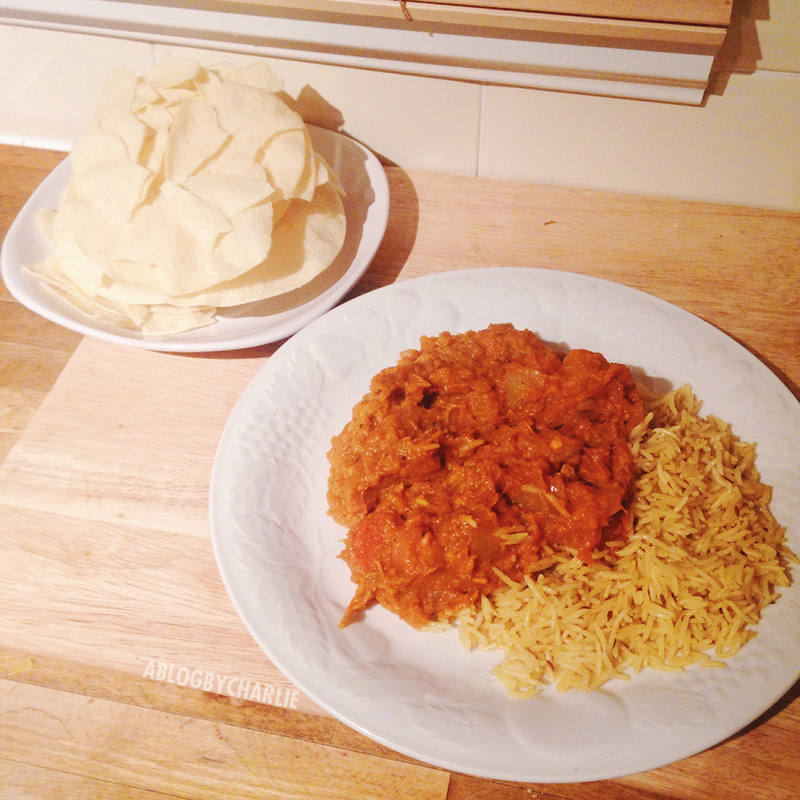 Dish up the rice on a plate and put your curry mixture on top.